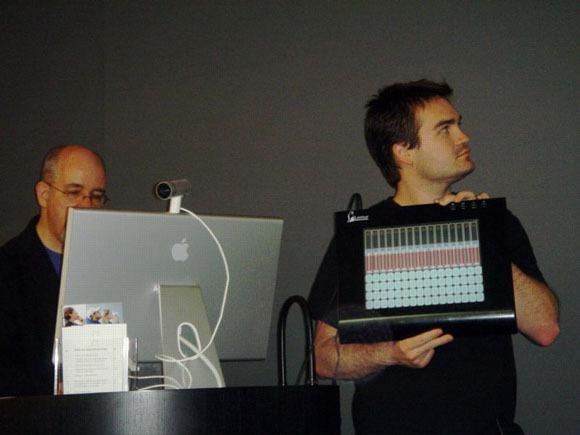 Cycling ‘74 offered a glimpse into digital music’s future last night at the San Francisco Apple Store, with one of the first public appearances of the JazzMutant Lemur programmable touchscreen controller working in concert with its software editor. Unlike conventional touchscreen tablets, the Lemur can support multiple simultaneous finger taps, making it, at least theoretically, possible to even play piano on the thing. 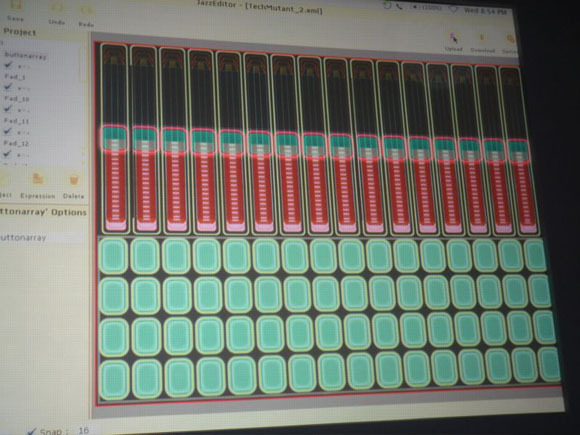 Product Specialist Gregory Taylor showed how easy it is to create customized control surfaces merely by dragging intelligent user interface objects onto a layout of the Lemur’s screen. The software ships with some 16 of these widgets, including the expected sliders and knobs, along with more experimental ones like bouncing balls that react to friction. Once the interface is constructed, it can be downloaded in seconds to the Lemur over an Ethernet connection using Open Sound Control. The Lemur can communicate in both directions with the computer it is connected to and used to control anything in Max/MSP or Jitter that you’d like. The possibilities are literally endless. Taylor explained that the Lemur was designed for “idiosyncratic interface control, because nobody wants to perform all the time on a laptop.” In fact, the Lemur should probably have been called the Chameleon due to its ability to transform itself from a mixing board to a drum machine to video controller, to a way to convert incoming email into MIDI data (gee, I wonder what my SPAM would sound like? ).